Whether blazing an acoustic path of mood and emotion, or sonic electronic vibrations, music by Thomas Goodlunas syncs to the rhythm of living. Like a distant melody in the mist it may be haunting, intimate, and soaring. Like a hill country train thundering down the rails, it may be gutsy, visceral, and downright intense. 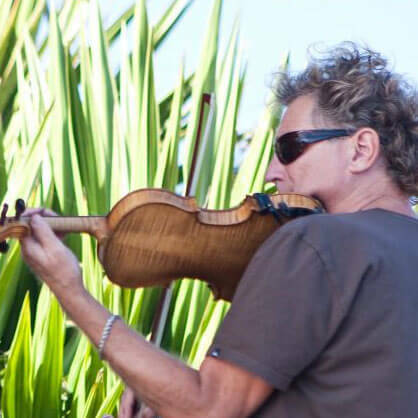 Thomas’ writing showcases his versatility as a composer, songwriter, and multi-instrumentalist who thrives on interpreting music across many genres including Americana, folk, new age chill, or gypsy-jam-band. His energized performance on violin-fiddle, piano, guitar, and vocals fuse strong melody with solid grooves offering listeners a unique listening experience. What to know more? Join my email list to hear about new music and to get updates. Have a question? You can contact me here. Hear new music. Get updates.